Barbarian Training is a miniquest in which players learn how to train their skills as the Barbarians once did during ancient times. Barbarians train their Fishing, Firemaking, Herblore and Smithing skills far differently from the rest of the RuneScape world. To some, these methods may seem unorthodox — perhaps even a bit extreme — but the advantages are worth it! 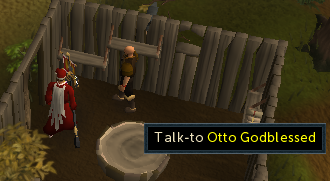 Speak to Otto in Otto's Grotto, located east of the Grand Tree and southwest of the Barbarian Outpost. 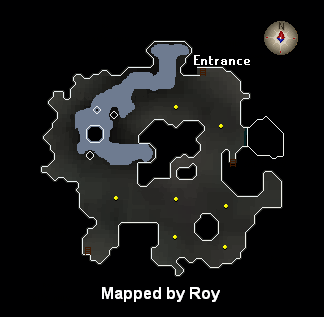 To begin this mini-quest, speak to Otto who can be found in Otto's Grotto located southwest of the Barbarian Outpost and east of the Tree Gnome Stronghold. 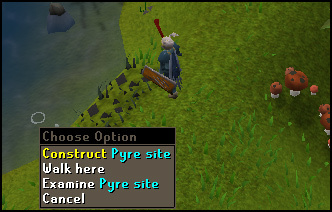 To get here, you can teleport to Barbarian Outpost, use the Spirit Trees and walk from The Grand Tree or just walk from Ardougne. 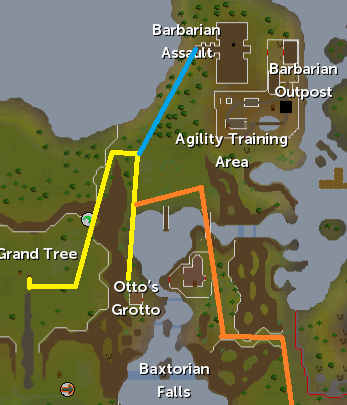 There is also another route from the Grand tree, via the Agility shortcut Northeast of the Tree. Once you arrive there, talk to Otto Godblessed. Click on any of the options to get started. Otto will give you a log book called 'Barbarian Skills' to record your progress. Skills: 48 Fishing, 30 Agility, 30 Strength. Talk to Otto about fishing. He will tell you to search under his bed for a Barbarian Fishing rod. Search the bed and head outside, over to the lake. You probably saw some fishing spots coming to Otto, go there and click 'Use rod-fishing spot'. You will begin catching Leaping Trout, Salmon, or Sturgeon. After catching three or four fish, go talk to Otto. He will tell you to go catch some Swordfish or Tuna without a harpoon, but you do not have to. This method saves one inventory space. 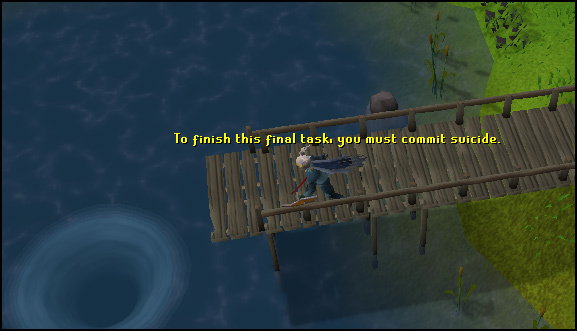 Congratulations, you've completed Barbarian Fishing! 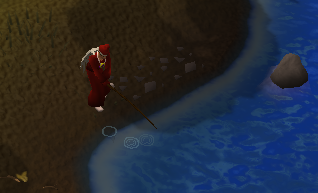 Note: Fishing for leaping fish after level 70 fishing is a great way to level up your fishing. Items: Any kind of bow, logs. Talk to Otto about Barbarian Firemaking. He will tell you to use your bow with some logs to light a fire. Once you've lit a fire, go back to Otto to complete. After completing this, you can start the Pyre Ship task. Talk to Otto about potions. He will tell you to use your knife on the fish. If successful, you will get Fish offcuts, Roe, or Caviar. The offcuts are used for fishing bait, while the Roe and Caviar can be used in 'Enhancing' potions. Otto will then tell you that he requires an Attack Potion mixed with roe. Take your roe and use it with your potion to get Attack Mix(2) Talk to Otto and he will accept it. Congratulations, you have completed Potion Enhancement! Quests: Tai Bwo Wannai Trio. Items: Hammer, any type of metal bar. Talk to Otto again, and he will tell you about Tai Bwo Wannai Trio. If you have already done this, you can proceed forward. He will tell you to make any kind of spear. 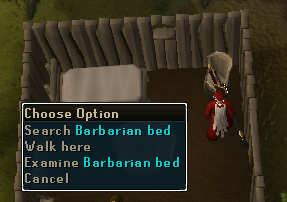 Go to the Barbarian Anvil south of Otto's house and use your metal bar on it. Some options will show up in your chat box, and click 'An [any metal] Spear'. You cannot make Metal Hastas yet. After doing this, you will get a Spear. Talk to Otto again. He will tell you that you can now make Hastas. 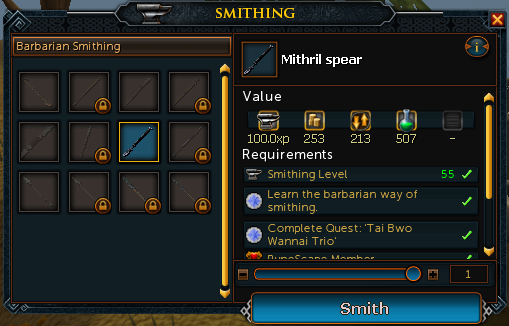 Congratulations, you have completed Barbarian Smithing! Note: Bronze uses regular logs, iron uses oak and so on. After Completing the next part, you can make a hasta. Talk to Otto, and then use the anvil again. This time, select the Hasta option. You will get a Hasta. Bring your freshly made hasta to Otto and he will tell you that you are 'Approaching readiness to living life to it's fullest." Skills: Ability to defeat a level 112 Mithril Dragon. 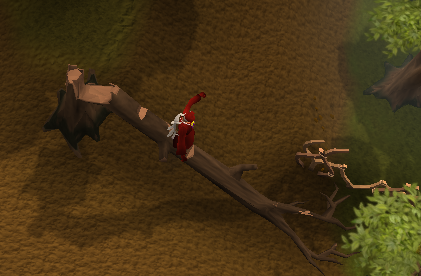 Items: Logs, Tinderbox or Bow, woodcutting axe, Anti-Dragon Shield. Talk to Otto again. After speaking about crafting the ships, jump through the whirlpool to the north of Otto. to enter the Ancient Cavern You will end up in a ledge in the dungeon. The second you go down a small staircase to the East of the ledge, you will end up with the dragons. Note: Don't forget you're Anti-Dragon Shield, as you'll be fighting fire-breathing dragons! The Mithril Dragons are located throughout the upper level of the Ancient Cavern. There are also barbarians, waterfiends and brutal green dragons in the dungeon but those won't give you too much trouble. Best stay away from the water though! 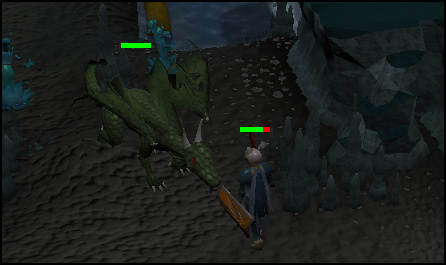 Kill Mithril Dragons (Level 112) until you receive some chewed bones. Note: Do not use the mangled bones, or you'll be fighting a level 100+ angry spirit. You will put the spirit to rest and it will leave behind a reward. Go back to Otto to complete your mini-quest! Congratulations, you have completed Barbarian Training!